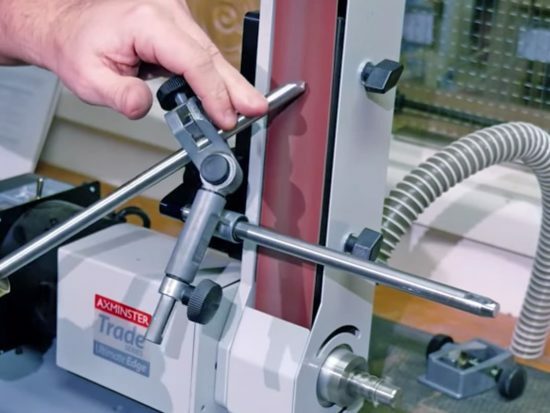 Those dedicated readers who frequent ‘The Knowledge’ pages of the Axminster website won’t have failed to notice that there was an article published quite recently by ‘Team Axminster’ on Drum Sanders. 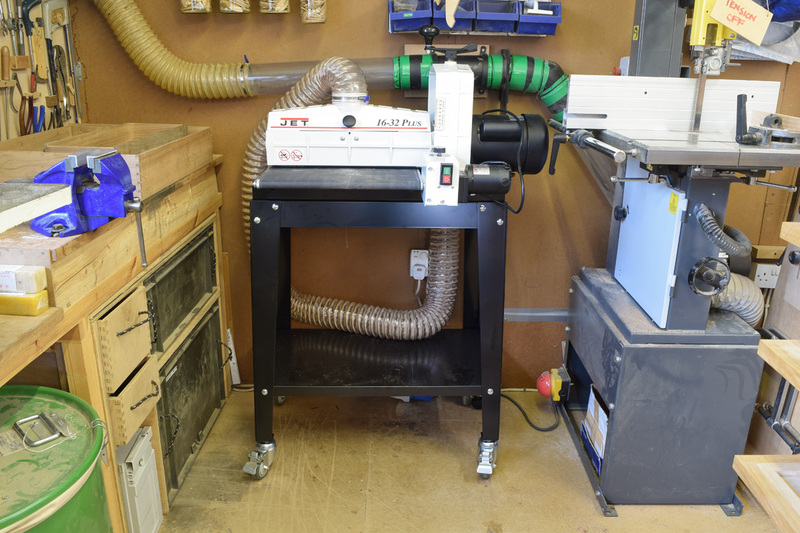 The main thrust of the piece was that a drum sander ought to be considered as one of the basic choices when setting up new workshop or, indeed, as an addition to an existing one. Having digested the article, the little grey cells slowly started to align themselves and a visual inspection of the ‘shop late one night after a tincture or three of ‘vino collapso’ confirmed that I just about had enough space to shoehorn one in. 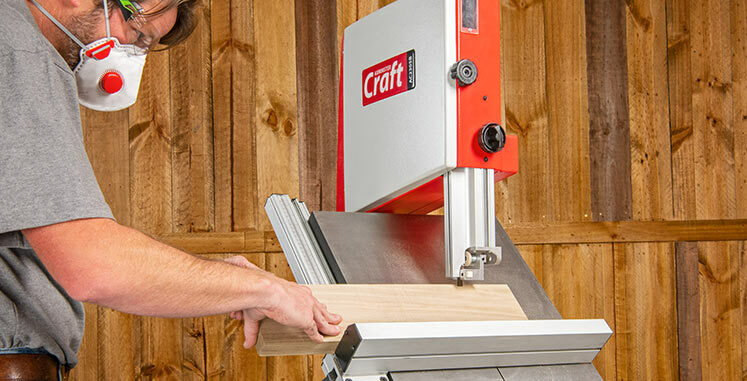 To be fair, I’d been thinking on and off about a drum sander for quite a while, but the rather excellent article crystallised my train of thought and I decided to take the plunge, aided and abetted by the unbiased reviews which are always worth reading at length before hitting the ‘payment’ button. 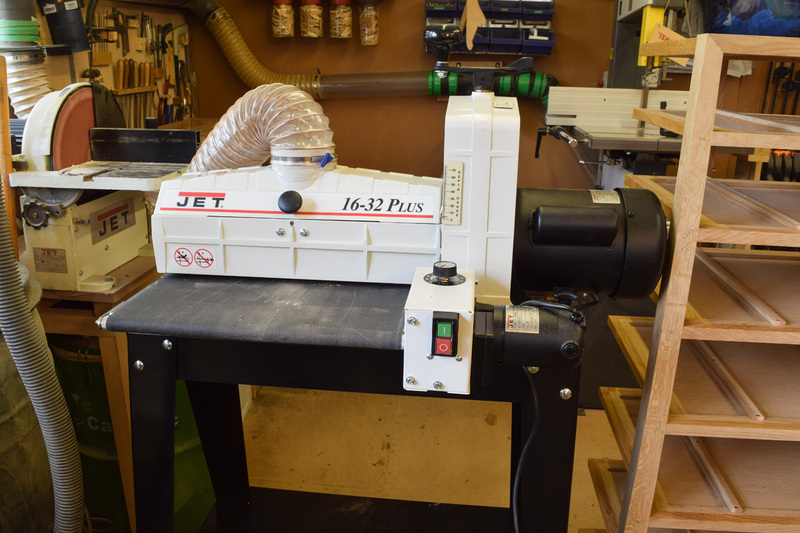 In due course, the Jet 16-32 drum sander arrived but the little grey cells weren’t quite in pristine condition (not an infrequent occurrence by any stretch) because I’d ordered the extension tables as well which I soon realised aren’t necessary in my workshop for normal day-to-day use. Bolting the stand together was fairly straightforward. However, it was slightly more awkward to locate the four mounting bolts underneath securing the sander, but eventually the complete machine was assembled. 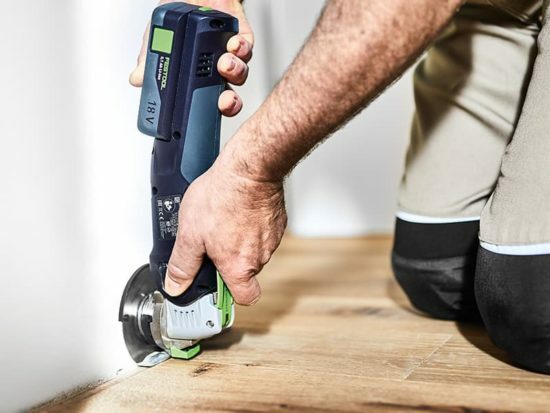 Whilst I found the extension tables weren’t necessary in my ‘shop, the optional locking castors are an absolute must-have as they allow the machine to be pulled forward away from the wall into its operating position. 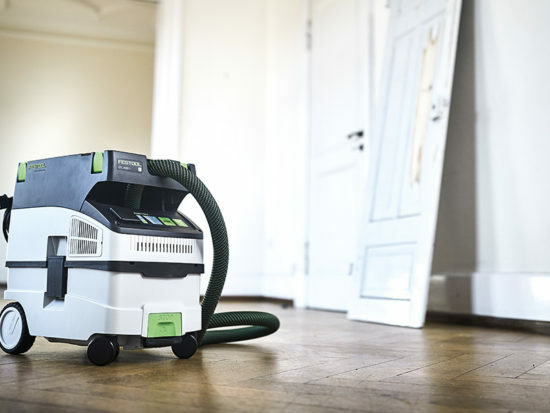 The other essential is that the sander must be connected to an extraction system that will handle fine dust. I use a twin motor Camvac extractor, where the ports on top of the machine are ducted outside the workshop. This means that even the exhaust air containing the very finest dust is safely removed. 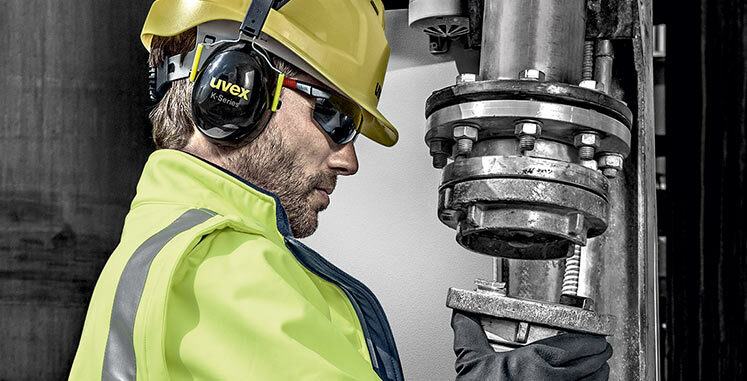 When connected to the machine, a 2.5m length of flexible hose is more than sufficient to allow a quite a generous working space when it’s pulled away from the wall. I also connected the hose at a slight angle, so that when the machine’s in use, the hose isn’t trailing over the moving conveyor belt. 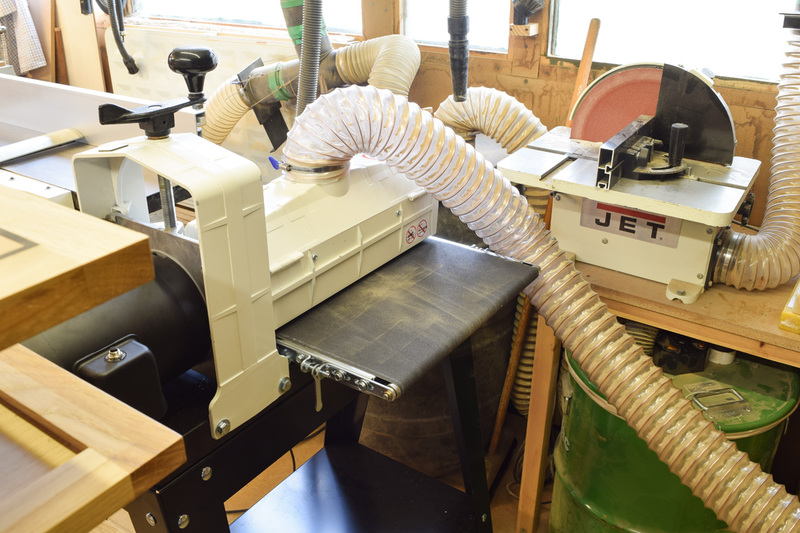 As it’s set up now, the extraction system is ideal in handling the dust produced by the sander. Having assembled the machine, it’s essential to follow the set-up procedure as detailed in the manual, particularly setting the drum alignment. This entails removing the 80g loading wound onto the drum and using a straightedge or ruler to check that the drum is parallel to the conveyor. Fortunately, the drum was perfectly set up and required no subsequent adjustment, after which the loading was rewound and the Tuf Tool was used to obtain adequate tension on the inboard side of the drum. 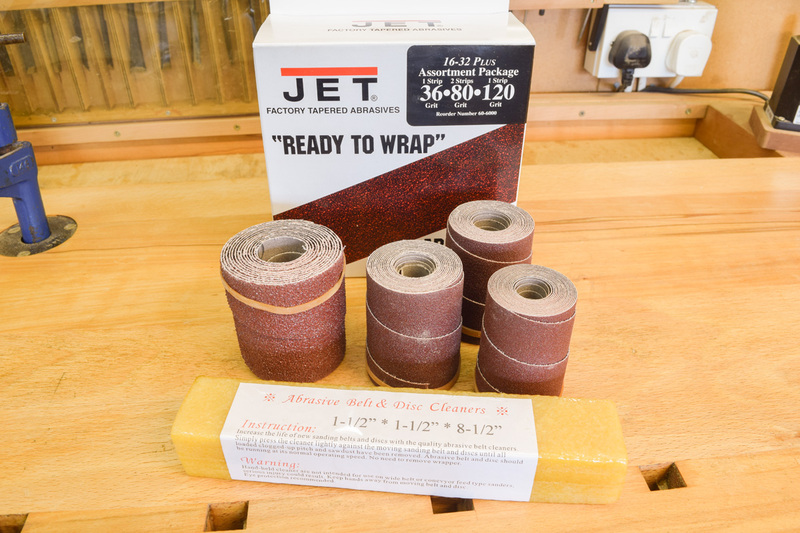 As well as the Tuf Tool, Jet also supply a box of assorted sandpaper loadings and a stick of abrasive cleaner, which incidentally should be used quite frequently to clean the loading. It seems that 80g is the preferred grit to use with the machine, as two additional rolls are supplied, as well as a 36g and 120g. The 36g loading isn’t really recommended for much except extreme stock removal or perhaps taking off a painted finish. As it is, the 80g loading, combined with a moderate conveyor speed (which is controlled independently) removes material quite rapidly and if by chance too much is taken off (as I initially did) the thermal reset button on the motor casing pops out. One of the things which is highly useful is the machine’s ability to take off a very small amount of material on thin stock; a process which is very difficult if not impossible on a planer thicknesser. 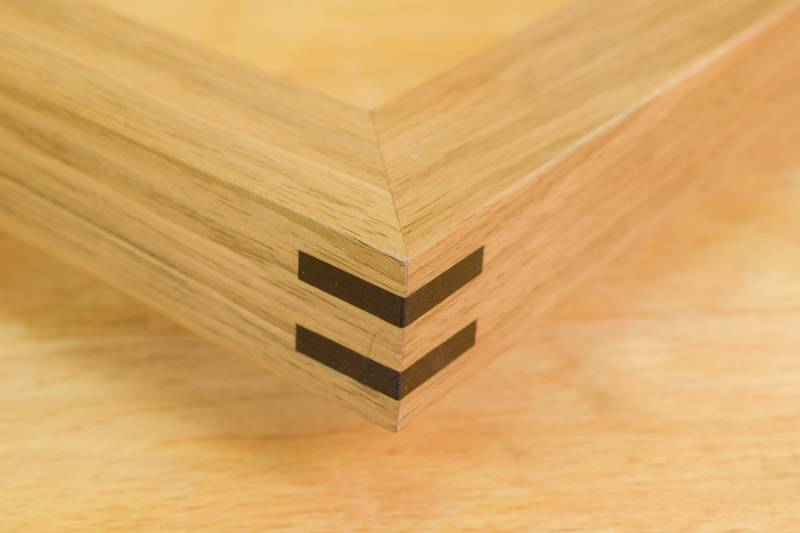 I recently had to make a picture frame and I always use some 4mm ebony inserts to reinforce the joint. Running a strip of ebony through a thicknesser to precisely 4mm is a bit hit and miss at the best of times, but with a drum sander it’s remarkably easy to tweak the control handle the merest fraction each time to sneak up on exactly the right thickness. It’s early days yet with the drum sander and there’s a definite learning curve to find out how to use the conveyor speed and loadings to the best advantage, but my instinct tells me that it’s going to be an extremely useful addition to the workshop, particularly when I’ve prepared a load of thinnish bandsawn veneers which will need sanding to an even thickness. If you’ve any thoughts and comments on these machines or can offer further insights into their use, by all means leave a comment below. Having originally had only a garage sized workshop, well OK only an actual garage, I opted to buy wood sawn close to size and a drum sander (a Jet 22-44) in place of a thicknesser and have found with the right loadings that you can actually make do with just a drum sander for even significant resizing of oak and beech boards. 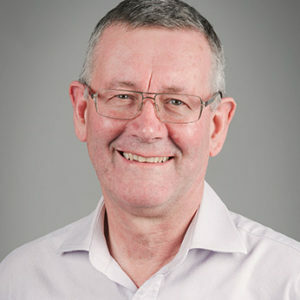 The only down sides is that loadings don’t appreciate being changed that often as the part that fits into the clips wears quickly and will fail. So not I ten to use only 80 grit and remove scratches with a belt sander then Mirka. 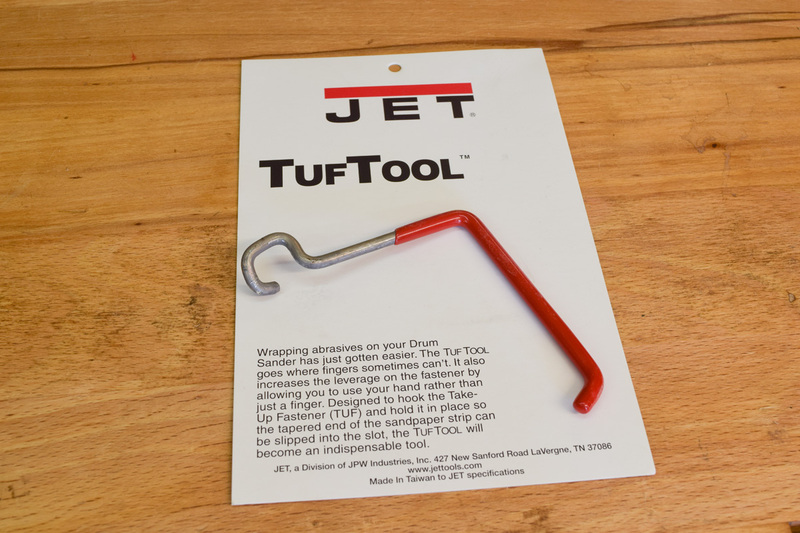 I have seen a shop where they use only a dual drum to size and finish wood and am waiting for my 8 year old Jet to wear out so I can replace it with one of those.